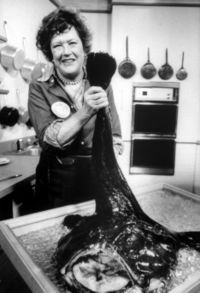 Julia Child (August 15, 1912–August 13, 2004) was a famous American gourmet cook, author, and television personality who introduced French cuisine and cooking techniques to the American mainstream through her many cookbooks and television programs. Her most famous works are the 1961 cookbook Mastering the Art of French Cooking and the television series The French Chef, which premiered in 1963. Born Julia Carolyn McWilliams to John and Julia Carolyn ("Caro") McWilliams in the wealthy community of Pasadena, California, she grew up eating traditional New England food prepared by the family maid. She attended Polytechnic School from fourth grade to ninth grade and then The Branson School in Ross, California. After graduating in 1934 from Smith College—where at six feet, two inches (1.88 m) tall she played basketball—with a Bachelor of Arts degree in history, she moved to New York City and worked as a copywriter for the advertising department of upscale home-furnishing firm W. & J. Sloane. After returning to California in 1937, shortly before her mother died, she spent four years at home, writing for local publications and briefly working in advertising again. Civic-minded, she volunteered with the American Red Cross and, after the bombing of Pearl Harbor in 1941, joined the Office of Strategic Services (OSS) after being turned down by the United States Navy for being too tall. For a year, she worked at the OSS Emergency Sea Rescue Equipment Section in Washington, D.C., where she was a file clerk and also helped in the development of a shark repellent. In 1944 she was posted to Kandy, Ceylon (now Sri Lanka), where she met her future husband, a high-ranking OSS cartographer, and later to China, where she received the Emblem of Meritorious Civilian Service as head of the Registry of the OSS Secretariat. Following the war, she lived in Washington, D.C., where she was married on September 1, 1946 to Paul Cushing Child, a man of sophisticated palate who came from a prominent Boston family and who had lived in Paris as an artist and poet. He joined the United States Foreign Service and also introduced his wife to fine cuisine. She learned to cook in order to please him and entertain their large social circle. In 1948, they moved to Paris after the U.S. State Department assigned Paul Child as an exhibits officer with the United States Information Agency in Paris, France. The couple never had children. Child repeatedly recalled her first meal in Rouen of oysters, sole meunière, and fine wine as a culinary revelation. She described the experience once in The New York Times newspaper as "an opening up of the soul and spirit for me". In Paris, she attended the famous Le Cordon Bleu cooking school and later studied privately with master chefs like Max Bugnard. She joined the women's cooking club Cercle des Gourmettes where she met Simone Beck who, with her friend Louisette Bertholle, was writing a French cookbook for Americans and proposed that Mrs. Child work with them to make it appeal to Americans. In 1951, they began to teach cooking to American women in the Childs' kitchen, calling their informal school L'Ecole des Trois Gourmandes (The School of the Three Gourmands). For the next decade as the Childs moved around Europe and finally to Cambridge, Massachusetts, the three researched and repeatedly tested recipes and Child translated the French into American English, making the recipes detailed, interesting, and practical. The three would-be authors initially signed a contract with publisher Houghton Mifflin, which later rejected the manuscript for being too much like an encyclopedia. Finally, when it was first published in 1961 by Alfred A. Knopf, the 734-page Mastering the Art of French Cooking was a best-seller and received critical acclaim that derived in part from the American interest in French culture in the early 1960s. Lauded for its helpful illustrations, precise attention to detail, and for making fine cuisine accessible to the masses, the book is still in print and is considered a seminal culinary work. Following this success, Child wrote magazine articles and a regular column for The Boston Globe newspaper. A 1962 appearance on a book review show on the Public Broadcasting Service (PBS) station of Boston, WGBH, led to the inception of her television cooking show after viewers enjoyed her demonstration of how to cook an omelette. The French Chef debuted February 11, 1963 on WGBH and was immediately successful. The show ran nationally for ten years and won Peabody and Emmy Awards, including the first ever Emmy award for an Educational program. Though she was not the first television cook, Child was the most widely seen and, with her cheery attitude and distinctively charming warbly voice, attracted the broadest audience. Child's second book, The French Chef Cookbook, was a collection of the recipes she had demonstrated on the show. It was soon followed in 1971 by Mastering the Art of French Cooking, Volume Two, again in collaboration with Simone Beck, but not with Louisette Bertholle, with whom they had ended their partnership. Julia's fourth book, From Julia Child's Kitchen, was illustrated with her husband's photographs. In the 1970s and 1980s, she was the star of numerous television programs, including Julia Child & Company and Dinner at Julia's. She starred in four more series in the 1990s that featured guest chefs: Cooking with Master Chefs, In Julia's Kitchen with Master Chefs, Baking with Julia, and Julia Child & Jacques Pépin Cooking at Home. She collaborated with Jacques Pépin many times for television programs and cookbooks. All of Child's books during this time stemmed from the television series of the same names. Child was a favorite of audiences from the moment of her television debut on public television in 1963 and her personage was a familiar part of American culture and the subject of numerous references. 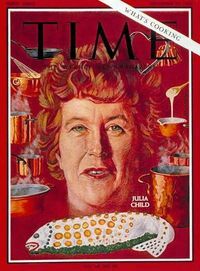 In 1966, she was featured on the cover of Time magazine with the heading, "Our Lady of the Ladle". In a 1978 Saturday Night Live sketch, she was affectionately parodied by Dan Aykroyd, continuing with a cooking show despite profuse bleeding from a cut to the thumb. Jean Stapleton portrayed her in a 1989 musical, Bon Appétit!, based on one of her televised cooking lessons. She was also the inspiration for a character, "Julia Grownup", on the Children's Television Workshop program, The Electric Company (1971-1977). In 1981, she founded the educational American Institute of Wine and Food in California with vintner Robert Mondavi and others to "advance the understanding, appreciation and quality of wine and food", a pursuit she had already begun with her books and television appearances. 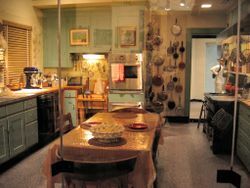 Julia Child's kitchen as seen on display at the National Museum of American History. Her husband, Paul, who was ten years older, died in 1994 after living in a nursing home for five years following a series of strokes in 1989. In 2001, she moved to a retirement community in Santa Barbara, California, donating her house and office to Smith College. She gave her kitchen, which was designed by her husband with high counters to accommodate her diminished but still formidable height, and which served as the set for three of her television series, to the Smithsonian National Museum of American History, where it is now on display in Washington, D.C.
She received the French Legion of Honor in 2000 and the U.S. Presidential Medal of Freedom in 2003. Child also received honorary doctorates from Harvard University, her alma mater Smith College, and several other universities. On August 13, 2004, Child died peacefully in her sleep of kidney failure at her home in Santa Barbara, at the age of 91.